If a PlayOnline ID with an active FINAL FANTASY XI Content ID has been linked to a Square Enix account with a FINAL FANTASY XIV service account, all new characters created on the FINAL FANTASY XIV service account will start out with a special in-game item. - Characters created before you linked your PlayOnline ID (It is, however, possible to receive the in-game item by deleting the characters you created, linking your PlayOnline ID, and then re-creating your characters). * Players who have only linked their PlayOnline ID to a Square Enix account (but have not transferred FINAL FANTASY XI) are ineligible. - If you have created a FINAL FANTASY XIV character before linking your PlayOnline ID (It is, however, possible to transfer Player Character names by deleting the characters you created, linking your PlayOnline ID, and then re-creating your characters). - If you create a FINAL FANTASY XIV character while FINAL FANTASY XI is not being billed (during the free trial period or while all characters have been suspended/cancelled). * If you have recently created a character, transferred Worlds, or used the Character Reactivation Service on FINAL FANTASY XI, it may take some time before you can transfer your Character name to FINAL FANTASY XIV. * Users can create characters with new names without transferring one of their FINAL FANTASY XI character names. Players with both an active FINAL FANTASY XI service account and an active FINAL FANTASY XIV service account will be able to discount their FINAL FANTASY XI monthly service fees from $12.95 to $7.00 for up to three months. * You are only eligible if you have linked your PlayOnline ID to your Square Enix account. * This discount is available from January 14, 2012 to May 11, 2012. Please note that once this period has ended, the discount will no longer apply. Billing checks will be performed on January 13, February 12, March 13, and April 12. 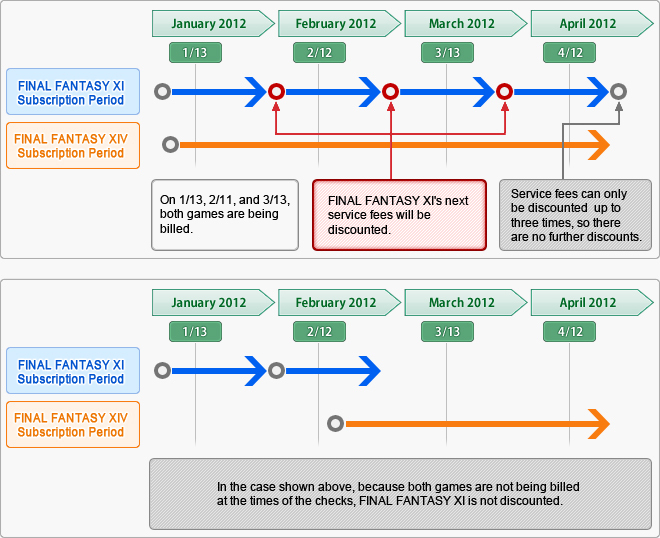 If both FINAL FANTASY XI and FINAL FANTASY XIV are being billed at the time of the check, FINAL FANTASY XI's service fees on the next billing date will be discounted. * You are not eligible for the discount if you have not linked your PlayOnline ID to a Square Enix account. For information on linking PlayOnline IDs, please refer to the Square Enix Account Transfer Information Page. * You are only eligible if you have linked your PlayOnline ID to a Square Enix account. * This perk is a limited-time offer that discounts FINAL FANTASY XI monthly service fees up to three times starting on January 14, 2012. * A single service account can be discounted up to three times. * Even if you have multiple active FINAL FANTASY XIV service accounts, the monthly service fee discount for a single FINAL FANTASY XI service account will not change. * If you have a single FINAL FANTASY XIV service account and multiple FINAL FANTASY XI service accounts, you will be able to receive a discount for one of your FINAL FANTASY XI service accounts. The service account with the nearest next estimated date of billing will be the one discounted. * If you have multiple FINAL FANTASY XIV and FINAL FANTASY XI service accounts, the number of FINAL FANTASY XI service accounts to be discounted will be the same as the number of active FINAL FANTASY XIV service accounts. The service accounts to receive the discount will be randomly selected. * At the time of the billing check, if your FINAL FANTASY XI or FINAL FANTASY XIV service account has been temporarily suspended, you may not receive the discount. ©2002-2011 SQUARE ENIX CO., LTD. All Rights Reserved.